Last week I told you my story and I introduced you to the three other ladies who are going on this health journey with me. If you missed it, check out all our introductions HERE. This week we're talking about workouts. What works for us, what doesn't, and most important - how we keep our workouts fresh and fun! Here are four things I do to keep my workouts interesting! When I jog I usually take Jacob with me because it's nice to have company. We count objects as we go, point out different things, and when I take breaks to walk he chants "Go, go, go! More, more, more!" which is super motivating. I also like to bring my phone so I can stream high energy music. I often use the Kesha station or the Pitbull station as they tend to have fast beats I can run to. Goal setting is so important to keep morale up. Seeing how far I've gone and watching how much farther I have left to go keeps me moving. I have a rotation of three different youtube videos I use with free weights for arm workouts. I try to do one each day and by switching between the three I don't get bored. You can find the three arm workouts I use HERE, HERE, and HERE. How do you keep your workouts from getting boring? I'd love to hear your tips! And don’t forget to follow my other fabFITblogger Mamas! And come back next Friday for another Fab Fitness Post. 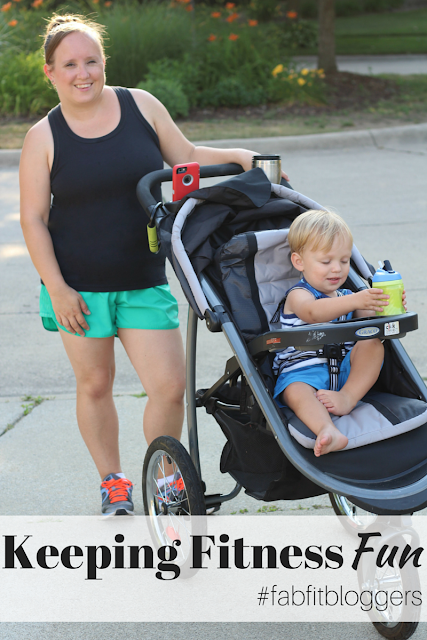 4 comments on "Bloggers Getting Fit: Makings Workouts Fun"
He is so cute and I love music in the stroller!! This is exactly what I need to be doing! I love your breakdown of how you do it!